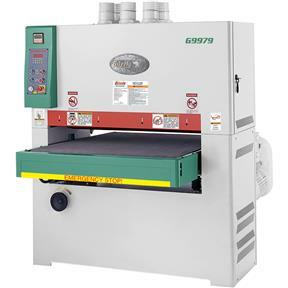 When your sanding needs fall under the category of production level, look no further than Grizzly for your wide belt sander. 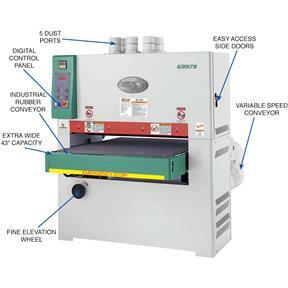 Manufactured for the industrial user, this machine features state-of-the-art electronics, precisely engineered components & innovative design & construction. Whether you need to sand a silky smooth finish on a highly figured tabletop, dimension rough lumber or simply run panels all day long, these sanders will make light work of the toughest jobs. CSA certified meeting CAN/CSA C22.2 #71.2-08 and UL 987 standards! Belt roller diameter (each): 4"
Size of sanding belt: 43" x 60"
Approximate shipping weight: 2490 lbs. Digital readout to within 0.005"